This summer has been a whirlwind of projects using either PVC or bicycle parts or both. After making the deer deterrent with two bicycle wheels and the hand-pump water gun with PVC, I wondered if I could combine the two into an energy-saving, wind-powered water pump. I did, but it took a LOT of tweaking and considerable input from friends, family and readers on Instructables where I posted the wind-powered water pump tutorial. 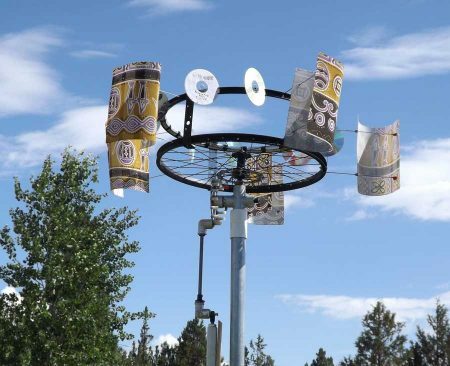 Basically, I started out by mounting the wind turbine onto a flimsy tripod, then eyeballing the installation of the water gun directly under the turbine and connecting the two with a PVC “arm” hooked to a bicycle ball bearing on either side. Well, the turbine worked great all by itself, and the water pump worked great by itself, but when the two were connected, the so-called wind-powered water pump would not pump water. My solution was to decrease the effort required by the wind turbine to pump water, so I lightened all the components below the wind turbine using bicycle shock parts. The piston for the water pump was now made from a bicycle shock without the spring and without the heavy grease inside (I used auto engine oil to lubricate it instead). But no matter how light all the other components were, the wind turbine still couldn’t move the pump handle up and down–until someone on Instructables mentioned that the most efficient wind turbine they’d seen had a louvred design where a whole bunch of tiny louvres would close shut to increase resistance on the attack side and swing open to release the wind drag on the back side. I wasn’t sure how to do this and still maintain the simplicity of this water pump, but I tried unhooking the wind foils from the bottom spoke in the turbine construction, and voila, it worked! All the wind was captured on the “attack” side and allowed to pass through on the “drag” side. The efficiency doubled immediately, and the turbine easily moved the water pump arm up and down. I’ve included the video of the final version of this wind-powered water pump so you can see what I’m talking about. If you want the whole story with detailed pictures and drawings, go to the tutorial on Instructables. Let me know if you can think of even more improvements.